I was playing around with patterns this morning, and thinking through what I want. 24-thread repeat in the threading, straight draw for maximum flexibility. 4-5 threads of every repeat must be in warp yarn #2 (to stretch my small supply of warp yarn #1). Floats of no more than 4 warp threads (because this is being used as outerwear). Using a weft-dominant twill in the background provides a black background.Â I want black to dominate in the fabric, toning down the red and keeping the coat from looking garish.Â I also think it is easier to make out colored patterns against a black background than to make out black patterns against a colored background.Â The eye is drawn to color, so naturally looks at the red first. It also results in fewer shafts being lifted, which is easier to weave. Using a twill background also ensures that the floats will be short. I wanted to try motifs that were symmetrical and equal in height and width.Â I felt just using diamonds didn’t provide enough visual interest, so I added a more circular pattern alternating with the diamonds.Â Then I felt the shapes clashed, so I altered the circles to be more diamond-shaped. 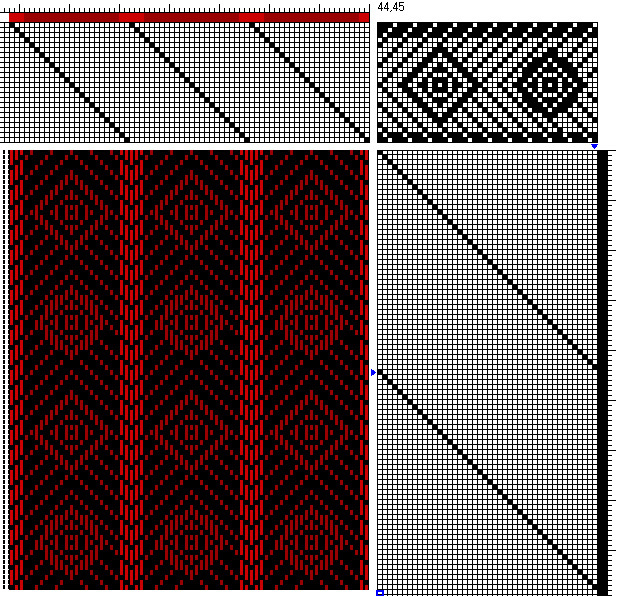 I made the twill lines reversing because I like the look of herringbone weaves, and I think they will also make me look taller. I put red in the warp and black in the weft because silk is shiny and cashmere is matte: shiny red silk will practically glow against a matte black cashmere background. The advantage to threading up straight draw on 24 shafts, with a 24-thread repeat, is that I can control each warp thread in the repeat separately and can therefore weave just about anything, provided it repeats every 24 threads. I would be happy sampling just with these colors/pattern, but will probably work up a lot more drafts before settling on something.Â This is because I’m leaving on an 11-day trip to visit relatives (mine and Mike’s) on Sunday and won’t have access to the loom or my yarns, so playing on the computer is all I can do (well, besides catching up on John Varley novels, and knitting socks). Speaking of which, this blog will go on semi-hiatus starting Sunday, as I’m not sure when I’ll have Internet access. Have a great holiday and best wishes for the coming year.